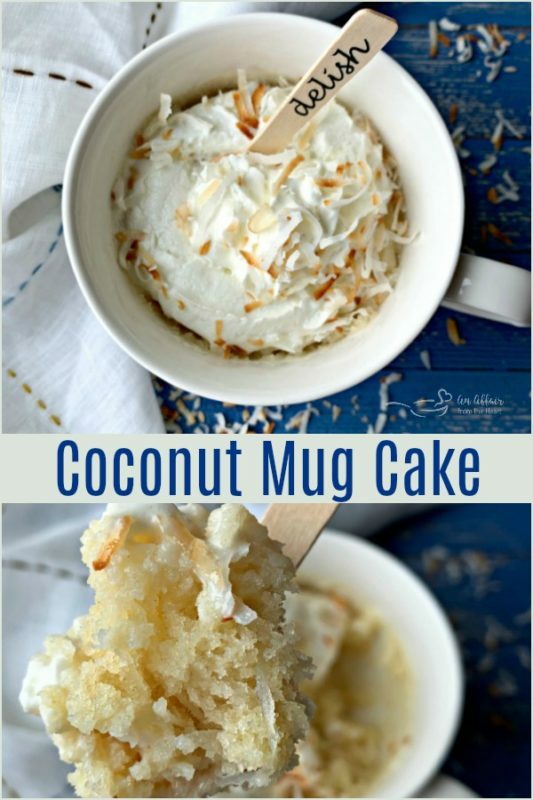 Coconut Mug Cake - Simple dessert for one, made in minutes. Need to curb a sweet tooth? This Coconut Mug Cake is just the thing. With simple ingredients and two minutes you can have a moist coconut cake topped with whipped cream and toasted coconut to enjoy. Dessert for one? Yes, please. Coconut Mug Cake. Just let that resonate for a minute. Picture this. You’re at home, binging your favorite Netflix Show of the moment. Then it strikes! The sweet tooth. But you don’t have anything that is really tripping your trigger. Then you remember … Michaela shared that little coconut cake for one — she promised me that all of the ingredients were easy ones I would have on hand. She even said it only took a couple of minutes to make! Netflix asks “Are you still watching?” (why must they judge like that? — YES I am still watching. Yes, I haven’t moved from my chair. Zip it, Netflix! ) You realize that you indeed DO have all of the ingredients right in your pantry. 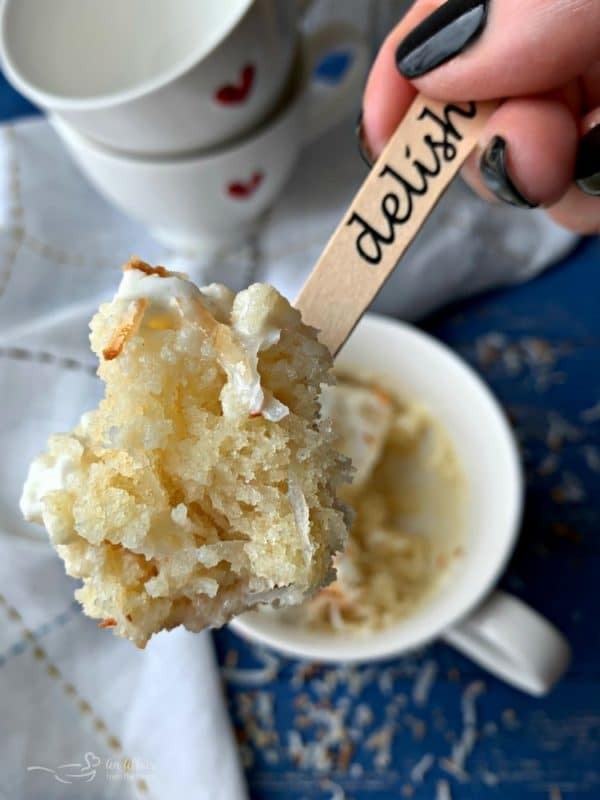 You grab your favorite mug and get to making this perfectly moist coconut cake, portioned for one. Of course — it doesn’t HAVE to be a dessert for one! It makes a great Date Night In dessert for you and your honey to enjoy together. 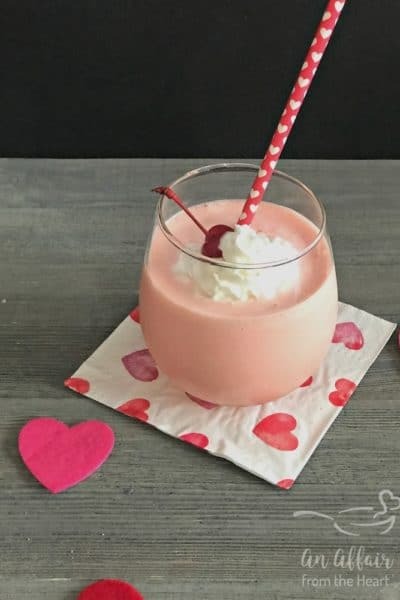 In fact, I think it’s a fantastic Valentine dessert, don’t you? Especially in these sweet mugs I picked up at Tuesday Morning. Making these mug cakes is a snap! I mixed everything up in a separate bowl, but honestly, if you don’t want to wash the extra dish, make them in the mug. I melted the butter in the bowl first and then used a tiny whisk to mix the rest of the ingredients in. Pop it in then microwave for about 90 seconds and let it cool slightly before topping with whipped cream and toasted coconut. If I want to make a mug cake, I know right where to go for the recipe! Madi, at Mildly Meandering has so many to choose from, and they are all superb!! When I was assigned Madi’s page for this round of Freaky Friday, I knew exactly what I wanted to make! Well, it’s a group I host, full of talented food blogger friends. Five times per year we swap blogs and cook/bake from our assigned website. It’s all done in secret, and on the chosen Friday we all reveal our recipes at the same time. It’s fun to see who had your blog, and what they chose to make. It’s also super fun to get to choose something to make of their’s, albeit difficult most of the time! that was no different this time. Even though I knew I wanted to make a mug cake — it was which mug cake to make? (she currently had TEN of them!) I actually made two, her Vanilla Mug Cake and her Coconut Mug Cake. I let my youngest daughter choose which one I would make for today. I did take a whole lot of time though to peruse her site. She has some amazing Asian inspired recipes, and is a master at Udon, and her her Japanese Cucumber Salad is happening soon! Two other recipes of Madi’s that are on my must make list are her Fluffernutter Cookies and her Apple Fritter Monkey Bread. I did make a couple of choices based on what I had on hand. Madi used unsweetened coconut in her cake, and I had sweetened coconut flakes. Either way, you can’t lose. If you want to cut back on the sugar, use the unsweetened, and opt for honey or a sugar substitute in place of the white sugar I chose. This cake turns out so perfect and moist. It’s packed with coconut flavor from the cake to the topping. I used canned whipped cream to make my life really easy. 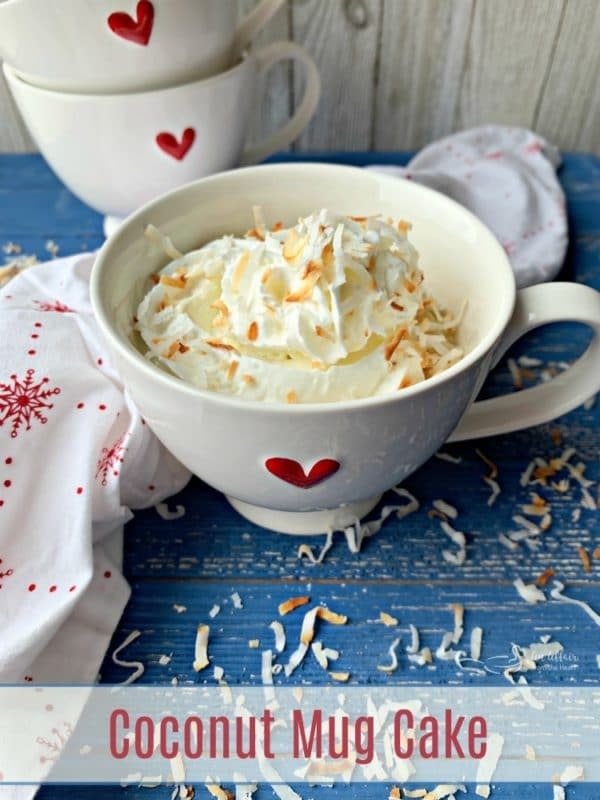 If you decide to make your own, add a dash of coconut extract to the whipped cream! YUM! One of my FAVORITE frostings I have ever made is my Coconut Cream Cheese Whipped Cream Frosting! It’s so good, it’s hard to not eat it by the spoonful before it gets to the cake! Toasting coconut is actually really simple, too. So don’t skip that part! I have a How To Toast Coconut post for you to look at, but all I did was toss a healthy pinch of sweetened coconut flakes into a small skillet and turned it on low. I toasted it while I mixed up the cake and microwaved it. Then I was read to add it to the top when the whipped cream went on. 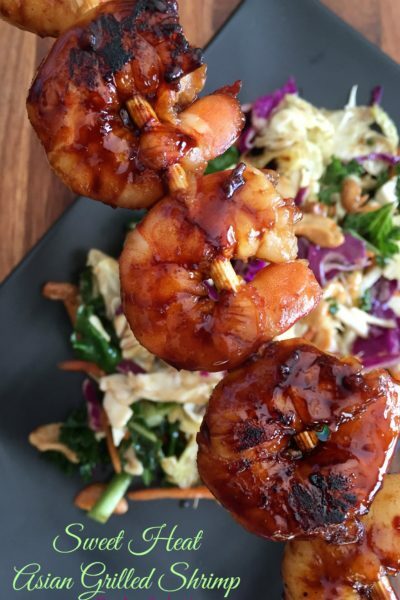 Of course, if you are planning ahead to make these, like for that date night we talked about? Then do this step ahead. Please be sure to check out Mildly Meandering, and browse through all of her recipes, read about her adventures as an English student at Michigan Tech, and keep up with her home life at one of the snowiest universities in the US, with her hedgehog, Sir Humphrey Pricklemeister, as well as her globetrotting travels. You will just love her. I know that I do! 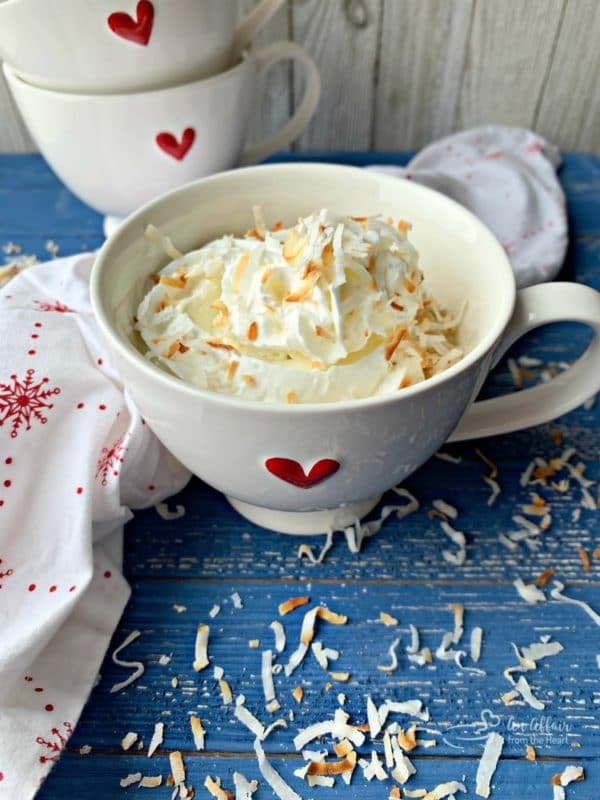 Time to get to making this coconut mug cake in minutes! Need to curb a sweet tooth? This Coconut Mug Cake the perfect dessert for one. Moist coconut cake topped with whipped cream and toasted coconut, in minutes. In a small bowl, melt butter in the microwave. Whisk in flour, baking powder, coconut, sugar, extract and milk. 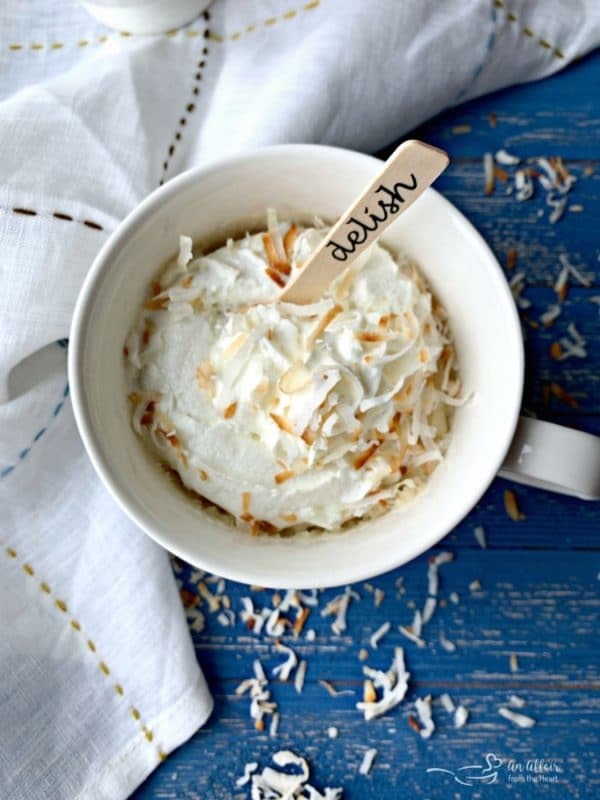 Cool slightly and top with whipped cream or ice cream and toasted coconut. You can cut back on the sugar by simply reducing the amount or by using honey or sugar substitute and unsweetened coconut. It's also delicious with Vanilla Almond milk! 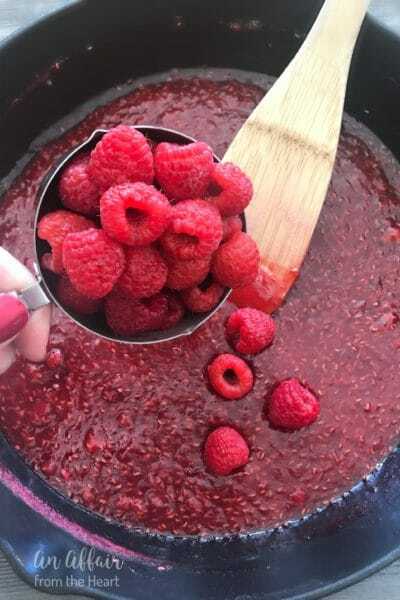 Mug cakes are so perfect when you just need a little something sweet, and this recipe is my absolute favorite! Love mug cakes! Just so easy for one serving, or more! This is so good! I made it for myself once the kids were in bed and it was the perfect way to end the day. Yay! That sounds like the perfect way to end a day! i have never made a mug cake until today! 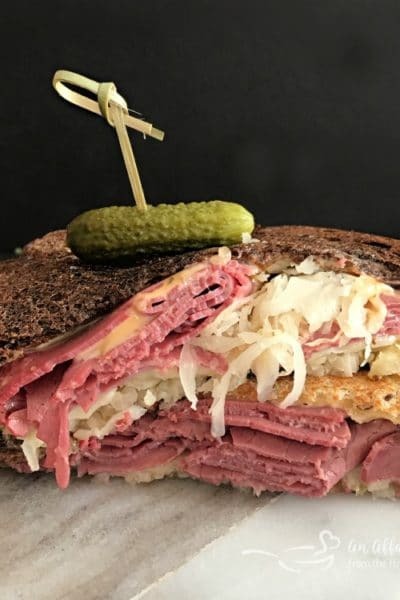 this recipe caught my eye! and im so glad it did! it did not dissapoint. yum! Awesome!! So happy you enjoyed it! That cake looks so good! I love all things coconut and I know this is going to be my new favorite cake! And, could that little mug and spoon be any cuter? I have never made a mug cake before but that is going to change now! This looks so good! And the texture looks wonderful too! 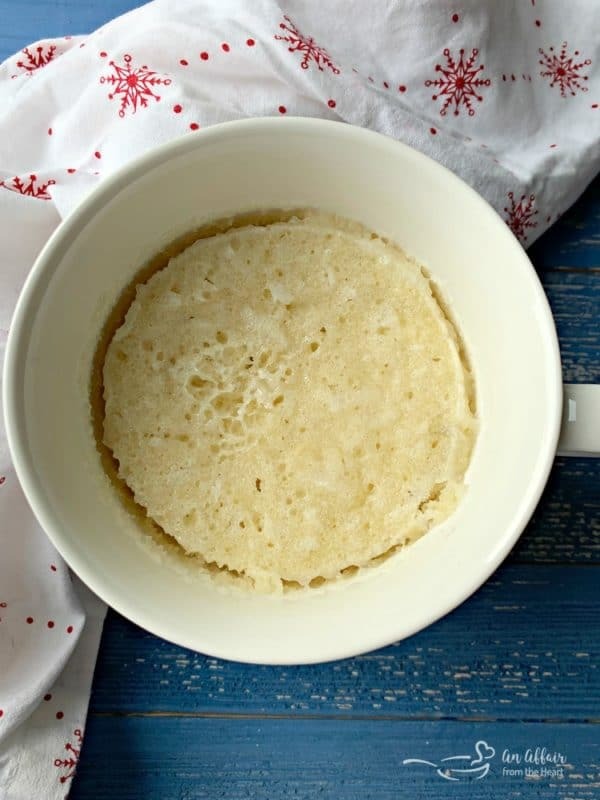 This mug cake embodies what all mug cakes should be – quick, easy and fabulous. YUM! This is such a good idea when you want a little something sweet!!!! It’s so super cute too! I’m so glad that you chose this recipe! Mug cakes are seriously the best! I loved it!! Next I want to make the carrot cake!! 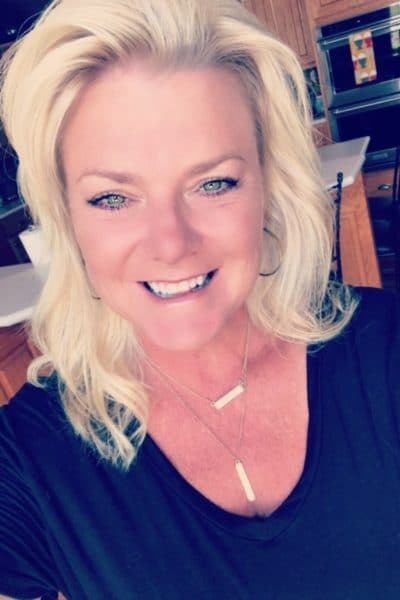 You just described me every night that my children are in bed and my husband is out of town for work… watching my new favorite show on Netflix, then the sudden sweet tooth strike. It’ll be amazing to have this mug cake in my back pocket for a time like that in the future because this sounds absolutely perfect. Thanks for hosting and making this Freaky Friday recipe swap happen–I had the BEST time doing this! 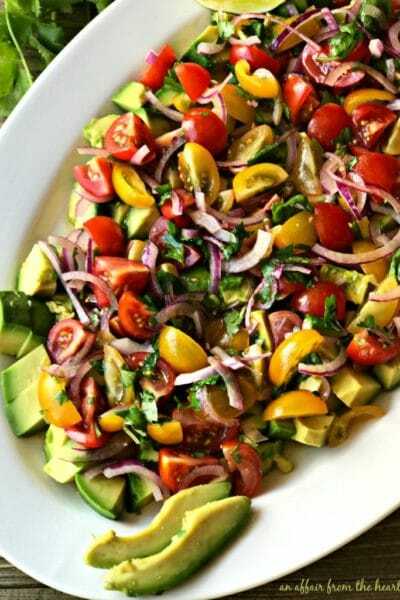 Oh my goodness, what’s not to absolutely love about this recipe?! A perfect little treat to snuggle up to on a movie night at home. These mug cakes were such a hit this weekend with all my friends! 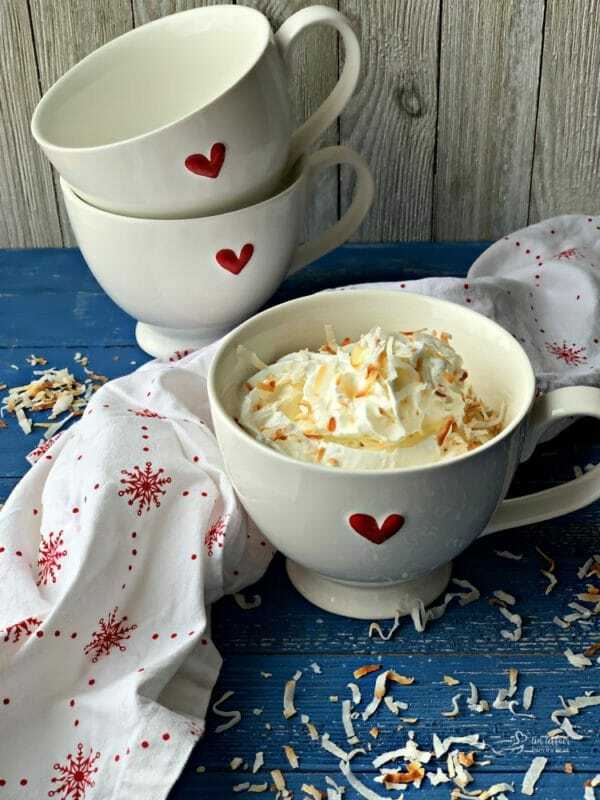 Sad to say that I didn’t have these adorable mugs to serve them in but they were so delicious! This is just great, Dan is always looking for something sweet and I made one for us to share last night. Delicious! What a wonderful recipe!!! I love this little mug cake. That cup is so adorable! I’m a fan of coconut and will definitely be toasting mine! Perfect cake for ME! I love personalized desserts and the fact that this can be cooked in the microwave is fantastic. It looks so tender! What binds it? I don’t see an egg in the ingredient list. I love mug cakes and these sound delectable. I also love your heart mugs. So sweet (pun intended). 😉 And I’m always happily surprised these cakes only take a few minutes. Lovely. What a nice change from the regular chocolate mug cakes. I love coconut desserts. I love a good mug cake! Can’t wait to give this a try! 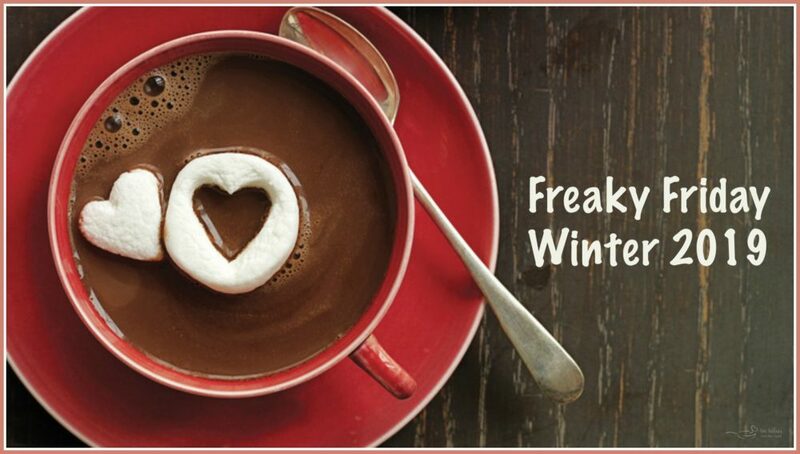 Mug cakes are the best when it is only you craving something sweet! I can’t wait to make this soon. I’ll have to add this mug cake to my collection! I usually go for chocolate, but wow this sounds really amazing! I love coconut cream pie, so I know this coconut cake I love just as much!! And made in a mug??? YUM!! !